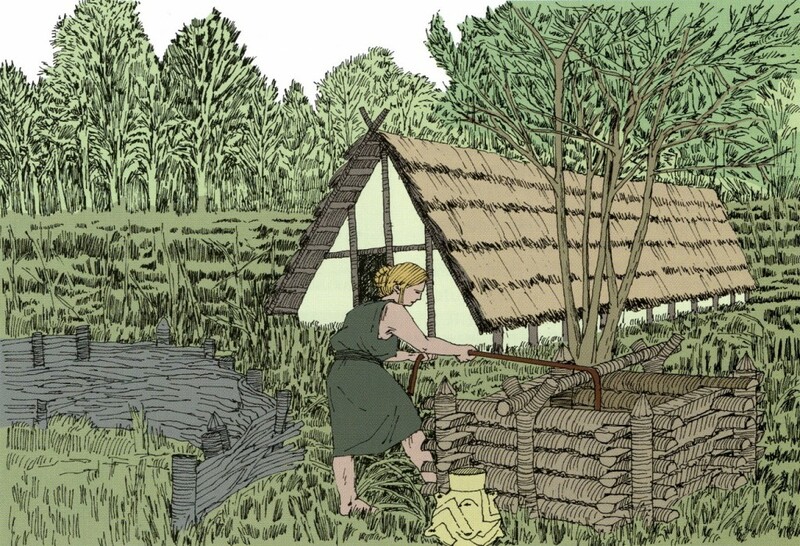 You might ask your­self how Neo­lithic farm­ers lived in Thuringia. In the ALT you can step into a recon­struc­tion of a thatched post-built house, with its mighty oak posts and adobe-coated, half-timbered walls. The recon­struc­tion is based on a the remains of a struc­ture excav­ated in Rudisleben (Muni­cip­al­ity of Ilm). Around 6,000 years BC a new way of life and new sub­sist­ence prac­tices, that had their ori­gins in Asia Minor, became estab­lished in Thuringia. This was such a titanic change for human soci­ety that it is referred to as the “Neo­lithic Revolu­tion”. People began to cap­ture wild anim­als, to tame them, and to use them as sources of meat. For the first time people kept and bred anim­als that we still know today. They also sowed crops and became farm­ers, prac­tising agri­cul­ture. In the ALT you can see seed imprints in pot­tery con­tain­ers. These provide us with inform­a­tion about the food crops of Neo­lithic farm­ers, among which were einkorn and emmer wheat, spelt, com­mon wheat, bar­ley, flax, car­rots, peas, and len­tils. Animal hus­bandry and agri­cul­ture were cul­tural accom­plish­ments that were pre­requis­ites for a sedent­ary way of life. A sedent­ary life­style led to the build­ing of houses with the res­ult that vil­lages formed. Our diorama of a vil­lage belong­ing to the earli­est sedent­ary groups, from Çatal­höyük in Tur­key, dat­ing to ca. 7,300 BC, trans­ports you back to the begin­ning of the Neo­lithic Revolu­tion. The Neo­lithic is also an era of mas­tery of spe­cial­ised crafts. Now that people had a per­man­ent roof over their heads and more time became avail­able, they could pro­duce the tools neces­sary for agri­cul­ture and build­ing. Tried and tested tech­no­lo­gies, includ­ing spin­ning, weav­ing, and stone bor­ing and sharpen­ing, were per­fec­ted or even re-inven­ted. Pot­tery was an example of such re-inven­tion and it was pot­tery, and in par­tic­u­lar the style in which it was dec­or­ated, that gave its name to the cul­ture of the first farm­ers and gra­zi­ers in Thuringia: the Lin­ear Pot­tery Cul­ture. The cul­tures that fol­lowed – named after find sites or pre­dom­in­ant styles and forms of con­tain­ers – include the Roessen Cul­ture and the Fun­nel Beaker Cul­ture. 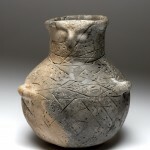 Out­stand­ing arte­facts, such as glob­u­lar cups, bottles, and round-bot­tomed jars can be admired in the ALT. 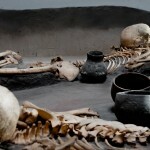 Neo­lithic burial cus­toms give pro­found insights into the beliefs of our ancest­ors and reflect social struc­tures. The ALT dis­plays strik­ing archae­olo­gical evid­ence, includ­ing the crouched inhuma­tions and cremated buri­als from Wander­sleben, a recon­struc­tion of a cham­ber tomb, and finds from the burial mound at Kalb­sri­eth.